First premolar was having an under fill in its distovestibular root canal. Meaning that one small diameter gutta percha point was floating in a canal with a much wider diameter. This available space allowed for a wonderful bacteria colonization which made the patient experiencing an A.A.A. 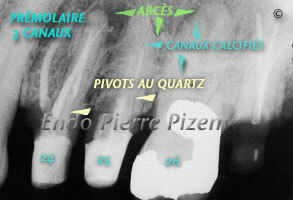 Second premolar was having a root canal filling half way down the canal creating another A.A.A. First molar had a necrotic pulp allowing for another A.A.A. Second molar was having a filled root perforation. This was a rather explosive situation. Fiberglass reinforced composite posts had to be removed in order to allow for endodontic retreatment, calcium hydroxide dressing in root canals helped to stop abundant exudation. An apical ledge was also present in first premolar distovestibular root canal and had to be bypassed. 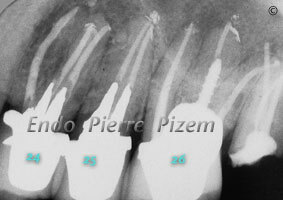 Root canals were filled with condensed gutta percha and Pulp Canal Sealer as a root canal sealer. Casted post were chosen to replace fiberglass reinforced composite posts. 6 months post operative control X ray film showed good bony repair. Teeth were completely asymptomatic.